One of the Harleys has been making a funny sound—and of course there is probably a more official mechanical way to describe the problem. After a lot of tinkering and even more advice, the decision is made to put it on the trailer for the last day. We are early to breakfast and somehow I am the only one who speaks Spanish. The waiter proudly announces the selections for breakfast and I translate for the group. Fortunately no-one is too picky about what they get if my translation is not quite perfect. We all enjoy the orange juice—it is so sweet. Finally we get on the bikes for our final day. 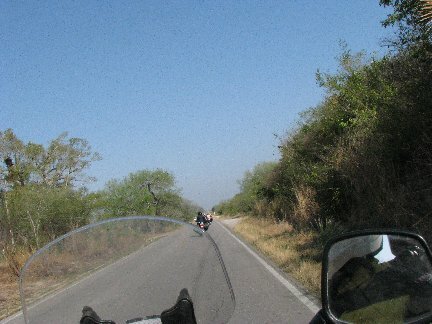 We are riding on the Pan American highway. The road is quite good and we pass many military convoys. They wave at us—but all of their machine guns are fully loaded and ready to use. I wanted to take photos but decided I did not want to chance explaining why I wanted their photos in my limited Spanish. I had taken my truck keys out of my luggage and placed them in a side pocket. I could feel them pushing up—and I wondered if they might be squeezed out of my pocket. Later I learned we were riding at 95 miles an hour—the fastest I have ever gone—unless you count airplanes. We stop at a gas station which has huge aisles of candies and cookies. One candy looks like birdseed—but is actually a peanut brittle type candy with lots of different seeds and nuts. Back on the bikes, we ride through large fields. Here the farms are clearly much larger. Tractors instead of the horse are used to work the fields. The fences are metal posts instead of the saplings stuck in the ground at intervals or the rock fences which climb up and down and around the hills. The day is getting warm and we no longer fear getting wet. Reynosa is hot and dusty but we must complete paperwork to de import our vehicles. Glen did not get a receipt for his entry into the country and so we must pay again. Everyone is a bit nervous as they all know they are close to ‘home’. The international bridge is stop and go traffic. Despite large signs warning against vending, people walk through the lines of traffic with large crucifixes or snacks in large bags that look like funny Cheetos with a dark red sauce added by the vendor at the time of purchase. When we get to the US border, the border patrol agent asks us if we are importing any humans—or any ceramics—or liquor. We are more than a bit startled as it would be rather difficult to stow any such items aboard the motorcycle. As we are about to ride away, he sees the package of empanadas I bought at the last gas station in my pocket and asks what it is. I tell him they are cookies and offer them to him. He laughs and waves us through. Right outside the border station, our leader’s bike stalls. We take the Harley off the trailer and put his bike on the trailer and proceed to the hotel where we find my truck patiently waiting for us. We all say good-by to each—it’s been a great trip—but we’re all tired and glad to be back in the US.